Before the reintroduction of lung volume reduction surgery (LVRS) in the mid-1990s as a surgical treatment for advanced emphysema , the routine clinical use of medical imaging for emphysema was largely limited to the chest radiograph. 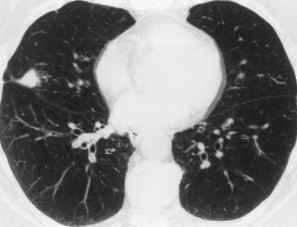 Emphysema was commonly depicted on computerized tomography (CT) scans of the thorax performed for other reasons, such as lung cancer diagnosis or staging; however, there has been little reason to apply advanced imaging techniques routinely to the emphysema itself. While CT for the detection of emphysema has proven useful in the evaluation of dyspnea patients with an isolated reduction in diffusing capacity at pulmonary function testing in the setting of a normal chest radiograph [2,3], this is a fairly limited indication for performing chest CT. Since the resurgence of LVRS, the imaging of emphysema with computerized tomography has received tremendous attention. Computerized tomography is the most accurate method in vivo for identifying and quantifying emphysema [4,5]. Many investigators have shown that the severity and distribution of emphysema within the lungs at CT are strong predictors of a successful outcome after LVRS, creating a new indication for the advanced imaging of emphysema [6-13]. Increasingly, the quantitative measurement of emphy sema is being advocated and used to measure the effectiveness of medical therapies for emphysema and change in emphysema over time [14-16]. This chapter defines the appearance of emphysema on CT, describes methods for quantifying emphysema with CT, and presents the published data on use of CT to select candidates for LVRS. Emphysema is commonly included with asthma and chronic bronchitis in the group of diseases that together make up chronic obstructive pulmonary disease (COPD). ''The term 'COPD' is generally used in clinical discourse to describe individuals diagnosed with one or more of the following conditions: asthmatic bronchitis, chronic bronchitis, chronic obstructive bronchitis and emphysema,'' according to a National Heart, Lung and Blood Institute Workshop on the subject . Airflow obstruction is common to all forms of COPD. In emphysema and chronic bronchitis, the airflow obstruction does not markedly change over months and is largely fixed or irreversible, while in asthma the airflow obstruction is largely reversible, except in chronic, long-standing asthma where airflow obstruction may also become fixed [18,19]. Of the approximately 15 million people in the United States with COPD, approximately 1.65 to 2 million have emphysema . According to the American Thoracic Society, emphysema is defined as ''a condition of the lung characterized by abnormal, permanent enlargement of the air spaces distal to the terminal bronchiole, accompanied by destruction of their walls,'' and without obvious fibrosis . In general, emphysema occurs due to an imbalance in the proteolytic activity in the lungs, resulting in destruction of alveolar tissue. This may be seen with an overabundance of proteolytic enzymes, a lack of antiproteases, or a combination of both. The pathologic classification of emphysema is based on the anatomic unit of the lung known as the secondary pulmonary lobule, with a paired pulmonary artery branch and bronchiole at the center of each lobule. The four major categories of emphysema are centrilobular (centriacinar), panacinar (panlobular), paraseptal, and paracicatricial . Centrilobular emphysema is the form of emphysema most commonly associated with cigarette smoking and is the most common form of emphysema overall. The destruction of alveolar walls begins in the central portion of the secondary pulmonary lobule; is heterogeneous, affecting adjacent lobules with varying degrees of severity; and is usually most severe in the upper lobes. The relatively greater ventilation-perfusion ratio in the upper portion of the lungs compared to the lung bases favors greater deposition of the particulate matter from cigarette smoke in the upper lungs. Activated macrophages release the proteolytic enzyme, elastase, and free radicals and oxidants in cigarette smoke inactivate the normally protective antiproteases, leading to greater destruction of the upper lobes that the lower lobes . Panacinar emphysema typically occurs in patients with a-1-antiprotease deficiency and is accelerated by superimposed cigarette smoking. In contrast to centrilobular emphysema, panacinar emphysema is usually more severe in the lower lungs than the upper lungs, and homogeneously affects the entire lobule as well as adjacent lobules. The proteolytic enzyme, elastase, is found within neutrophils and macrophages in the lung. More circulating a-1-antipro-tease is delivered to the lower lungs than the upper lungs due to the greater distribution of blood flow to the lower lungs. When a-1-antiprotease is deficient, the greatest deficiency from normal is therefore seen at the lung bases. With the lack of antiproteolytic activity, greater destruction of lung parenchyma occurs at the lung bases. Paraseptal emphysema involves the peripheral or paraseptal portion of the secondary pulmonary lobules and the apices and paramediastinal portion of the upper lobes and may be related to aging, although this remains poorly understood. Paracicatricial emphysema occurs adjacent to areas of scarring, fibrosis, and granulomas. As an example, it may be seen in the periphery of the upper lungs in patients with silicosis and conglomerate masses. Computerized tomography provides excellent anatomic detail for detecting, characterizing, and quantifying the severity of emphysema. Not surprisingly, high-resolution CT (HRCT) is more accurate than conventional CT at demonstrating the presence, severity and distribution of emphysema [21-23]. On CT, emphysema appears as areas of abnormally low attenuation pulmonary parenchyma, without definable walls, resulting in a decrease in the mean attenuation value of the lung parenchyma (Fig. 1) . Several investigators have shown that CT is accurate for quantifying emphysema, using either visual scoring methods or attenuation threshold-based quantitative analysis [4,5,21,25-36]. It should be noted that both visual scoring methods and quantitative analysis of emphysema may fail to detect mild emphysema [5,22]. The severity of emphysema identified on HRCT and conventional CT has demonstrated excellent correlation with the pathologic severity of emphysema, using both visual scoring systems and quantitative analysis [4,5,22,30,37]. Radiologic-pathologic study by Hruban et al. using a visual estimation of emphysema on in vitro 2-mm collimation HRCT images of resected lung tissue compared to the severity of emphysema in the pathologic specimens demonstrated a correlation of r = 0.91 (P < 0.005) . 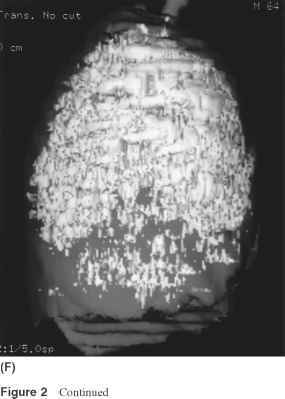 Subsequently, Muller et al compared a visual CT scoring system and the density mask technique (pixels between -910 and -1024 HU representing emphysema) applied to a single 10mm collimation axial image of the lung to the inflation-fixed lung specimen pathology scores in patients undergoing thoracotomy for tumor resection. The density mask technique is performed by setting an attenuation threshold below which all pixel values represent emphysema. Histologic specimens were scored using a modification of the Thurlbeck picture-grading system, with scores ranging from 0 to 100 (0 representing no emphysema) ; 89% of the 28 patients had pathology scores less than or equal to 50. The visual score (r = 0.9; P < 0.001) and the density mask score (r = 0.94) demonstrated excellent correlation with the pathology score. Using the visual method, the two CT readers missed emphysema on CT in six patients and three patients each; all had mild emphysema by pathology score. 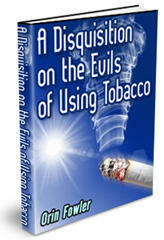 Each reader called emphysema in one normal patient. The density mask technique missed three cases of mild emphysema and incorrectly called one normal case emphysema. This yielded sensitivities of 71, 86, and 86% for reader 1, reader 2, and the density mask technique, respectively, and a specificity of 86% for each. Figure 1 Mild centrilobular emphysema. (A) Axial 1-mm collimation HRCT image through the midthorax demonstrates small focal areas of low attenuation without definable walls. (B) Axial density mask technique applied at an attenuation threshold of -950 HU demonstrates the emphysema in white. By knowing both the volume of the emphysema and the lung (using a density mask threshold of -700 HU and lower) the percentage of the lung replaced by emphysema can be measured. scored in each box as present or absent. A correlation of r = 0.81 (P < 0.001) was found between the 10-mm CT visual grid score and the pathology score that improved slightly, r = 0.85 (P < 0.001), using the 1.5-mm HRCT images . When performing quantitative analysis using an attenuation threshold technique, attention to regular calibration of the CT scanner to correct for any drift in CT numbers is critically important. Studies of third- and fourth-generation CT scanners from different vendors have demonstrated that scanner conformity is reproducible for lung densitometry measurements of attenuation and that measurement of the low-attenuation area of the lung with minimal variation can be obtained when appropriate calibration for water and air is performed [39,47,48]. The correct upper attenuation threshold to use for quantitative CT analysis varies with slice thickness and inspiration versus expiration. By using an inappropriately high threshold, emphysema will be overestimated, while using an inappropriately low threshold will underestimation emphysema. For example, the optimum threshold for 10-mm collimation inspiratory CT is -910 HU , while -950 HU is the optimum threshold for 1-mm collimation inspiratory CT . The optimum threshold for 1-mm collimation expiratory CT  has been shown to be -820 HU. Most quantitative analysis of emphysema is performed using CT obtained at inspiration. 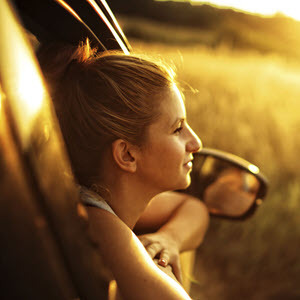 While some investigation has been performed on expiratory images, results are less accurate. For example, in a series of 89 patients undergoing lung resection undergoing both inspiratory and expiratory HRCT at 1-mm collimation, the quantification of emphysema was less accurate at expiration, which may in part be related to superimposed small airway disease resulting in air trapping and reduced lung attenuation . In this study a computer-based method was used to determine the areas of macroscopic and microscopic emphysema . With the use of spirometry gating, measurements are reproducible within the same patient, even in patients with severe respiratory insufficiency. These measurement are the most reproducible at 90% of vital capacity . At end-expiration, reproducibility in the same study was worse by a factor of three. Other quantitative measurements have been investigated, such as mean lung attenuation. However, these have demonstrated poorer correlation with the emphysema severity in pathologic specimens. For example, using 10-mm collimation images, the correlation between mean lung density and the visual score with pathology scores was only moderate, r = 0.44, P < 0.01, and r = 0.46, P < 0.01, respectively . A sliding thin-slab, minimum-intensity projection technique has recently been demonstrated to be more accurate at the detection of mild emphysema than HRCT, when evaluating images for the presence or absence of emphysema only . 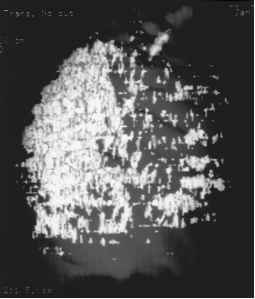 The quantitative analysis of the severity of emphysema referred to as the density mask technique was initially performed on selected axial two-dimensional images , with a region of interest drawn around the lungs on the image or images of interest. 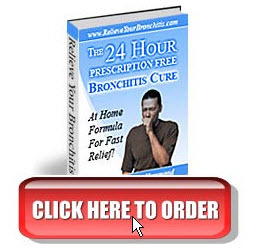 To perform this technique on the entire lungs is cumbersome. The same technique can be applied to a three-dimensional volume of the entire lungs acquired during a single inspiration using helical CT (Fig. 2-4) [13,41,42]. These analyses can be performed on commercially available scanner consoles or workstations from all CT scanner manufacturers. 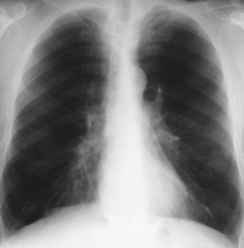 Figure 2 Upper lobe predominant emphysema in a 64-year-old man. Posteroanterior (A) and lateral (B) chest radiographs demonstrate pulmonary hyperinflation with flattened hemidiaphragms, increased anteroposterior chest dimension and an enlarged ret-rosternal clear space, increased lung height; less evident is the disparity between the fewer and smaller upper lobe pulmonary vessels compared to the lower lobes. Axial HRCT images through the upper lobes (C) and lower lungs (D) demonstrate more severe anatomic destruction in the upper lobes compared to the lung bases, with greater separation and thinning of pulmonary blood vessels at the lung apices. (E and F) Helical CT shaded surface display reconstructions of the lung in the anterior and lateral projections, with the emphysema displayed in white (all pixels less than —900 HU) on the background total lung volume (all pixels less than —700 HU), shown in gray. Using CT, the total lung volume was 6.6 L, compared to a total lung capacity of 6.9 L using pulmonary function testing. The emphysema volume was 3.6 L, or 54% of the total lung volume. Seventy-three percent of the upper half of the lungs and 37% of the lower half of the lungs is emphysema, for a CT ratio of 1.95. In conventional CT, individual axial images or clusters of axial images are obtained in a single breath hold, with the patient allowed to breathe before scanning of the next individual image or cluster of images. However, with variation in the level of each breath hold, portions of the thorax are inevitably missed or overlapped. The fast acquisition times of helical CT almost completely eliminate this error. Lung volumes, including total lung capacity (TLC) and residual volume (RV), can also be calculated from inspiratory and expiratory helical CT data with excellent correlation to static lung volumes . Other quantitative tools have been applied to the evaluation of data obtained from CT in patients with emphysema, including a texture-based adaptive multiple feature method (AMFM) incorporating multiple statistical and fractal texture features, but have not yet demonstrated clinically applicable uses [44,45]. The CT methods for quantifying emphysema have shown excellent correlation with diffusing capacity and pulmonary capillary blood volume, but only correlate moderately with measures of airflow obstruction, such as the forced expiratory volume in 1 sec (FEV1), forced vital capacity (FVC), and the FEV1/ FVC ratio [46,47]. Some have therefore speculated that the severity of expiratory airway obstruction in emphysema is not related to the severity of alveolar wall destruction [36,46-49]. In one study in which patients with emphysema underwent both inspiratory and expiratory CT, the visual emphysema score correlated well with the severity of emphysema, but not with air trapping. In contrast, the ratio of the CT attenuation number at expiration to inspiration (the E/I ratio) correlated well with air trapping and less well with emphysema severity . Figure 3 Diffuse emphysema in a 53-year-old man. 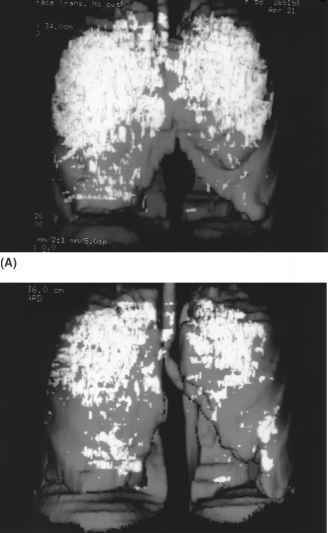 Axial HRCT images through the upper lobes (A) and lower (B) lungs demonstrate more uniform anatomic destruction throughout the lungs. Anterior (C) three-dimensional shaded surface display reconstructions shows diffuse emphysema. Using quantitative CT analysis, the total lung volume was 6.8 L, emphysema volume 3.6 L, with 54% of the volume representing emphysema. Fifty-five and a half percent of the upper half of the lungs and 52.4% of the lower half of the lungs represented emphysema, for a CT ratio of 1.06. 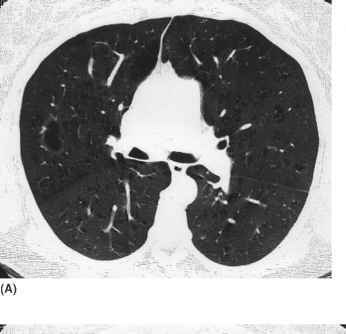 Figure 4 Lower lobe predominant panacinar emphysema in a 66-year-old woman. Axial HRCT image through the midlungs (A) demonstrate more uniform anatomic destruction posterior to the major fissures in the lower lobes than in the upper lobes. Lateral (B) three-dimensional shaded surface display reconstruction shows most of the emphysema posterior to the expected location of the major fissures. The anatomic distribution of emphysema in the lungs may also have differential impact on pulmonary function. For example, a greater severity of emphysema in the central portion of the lung has a greater correlation with pulmonary function impairment than peripheral emphysema, and the more uniform the emphysema between the upper and lower lung, or the central and peripheral lung, the more severe the airway obstruction [51,52]. Many investigators have now shown that the anatomic distribution of emphysema within the lungs demonstrated on CT is an excellent predictor of patient outcome after LVRS [6,8,9,13,53-58]. This has been shown for both visual semiquantitative or qualitative emphysema scoring systems [53-55,58] and quantitative analysis methods [6,8,9,13,56,57]. The more homogeneous the emphysema from lung apices to bases, the poorer the outcome after surgery. Patients with upper lobe or lower lobe predominant emphysema, referred to as target areas for resection, with large areas of normal lung remaining, experience the greatest improvements after LVRS. The advantages of a visual semiquantitative scoring system are both ease of application and that a computer workstation is not required for analysis. An advantage of quantitative analysis is the reproducibility of the technique across individuals of varying expertise, and across institutions, allowing more accurate comparison of results between different centers. While qualitative scoring systems for emphysema have reported excellent inter- and intraobserver agreement, the investigators have largely been experts in thoracic radiology, and whether such systems are effective among practitioners of varying expertise is unknown . Furthermore, a dominant method for the quantification of emphysema for LVRS selection has not yet arisen. Some examples of the use of qualitative and quantitative CT measurements of emphysema in the selection of LVRS candidates are as follows. In a series of 50 consecutive patients by Weder et al. undergoing bilateral LVRS with video-assisted thoracoscopy, a qualitative assessment of emphysema was made using preoperative HRCT and spiral CT images. Patients with markedly heterogeneous pulmonary emphysema had significantly greater improvement in FEV1 3 months after surgery compared to preoperative measurements (81% ± 17%) versus patients with intermediately heterogeneous emphysema (44% ± 10%) and patients with homogeneous emphysema (34% ± 6%) . Wisser et al. in a study of 47 patients undergoing bilateral LVRS by median sternotomy (n = 15) or video-assisted thoracoscopy (n = 32), used a 4-point grading scheme for emphysema heterogeneity and a 48-point scale for severity of lung parenchymal destruction on HRCT and helical CT images. The heterogeneity of emphysema correlated with postoperative improvements in FEV1 3 months after surgery, and all 4 patients who died within 30 days of LVRS had significantly greater parenchymal destruction scores (28.4 vs. 21.3; P = 0.003), and . Figure 5 Reduction in target zones of upper lobe emphysema after bilateral apical lung volume reduction surgery through a median sternotomy in a 59-year-old woman. Three-dimensional shaded surface display reconstructions before (A) and after lung volume reduction surgery demonstrate larger target areas of emphysema before surgery than after surgery. Prior to surgery, 65% of the upper half of the lungs represented emphysema using quantitative CT. After surgery, this number was reduced to 30%. mation of the entire lungs. These should improve the accuracy of helical CT quantitative assessment and potentially the accuracy of predicting outcome after LVRS. Quantitative helical CT performed before and after surgery can be used to measure the anatomic changes that occur due to surgery and evaluate for progression of emphysema in the remaining lung over time (Fig. 5). 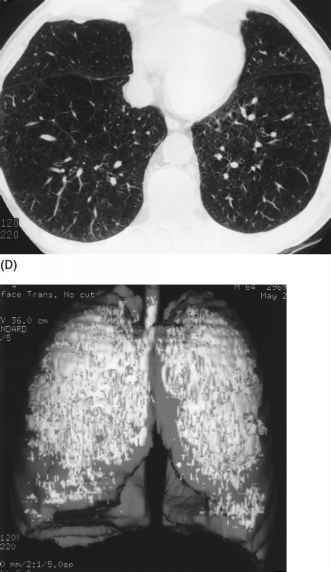 Figure 6 Incidental 14-mm noncalcified right middle lobe pulmonary nodule in a 72-year-old woman with emphysema undergoing CT as part of the evaluation for lung-volume-reduction surgery. The nodule is suspicious for bronchogenic carcinoma. To date, no tissue diagnosis or follow-up CT scan has been obtained. with close follow-up serial CT, biopsy, or resection is warranted to identify the malignant nodules. Unfortunately, PET scanning is not an option for most of these cases because of the small size of the nodules. Noncalcified lung nodules in one series were identified in 113 of 442 patients with severe emphysema being evaluated for LVRS, with only 22% of the nodules measuring greater than 1 cm in diameter . When a nodule is identified in an LVRS candidate, it is important to note whether the nodule is within the portion of lung that can be resected during LVRS, as some patients with insufficient pulmonary function to tolerate conventional lung cancer surgery with lobectomy may be eligible for resection of the nodule during a combined LVRS procedure, with the potential to improve pulmonary function and dyspnea as well as resect the malignancy . The combined surgery can be performed successfully, with little morbidity and mortality [65,66]. However, during such a combined procedure the LVRS procedure may be altered or compromised in order to completely resect the nodule, with some investigators reporting that the post-LVRS outcomes in patients undergoing combined nodule resection and LVRS are less substantial than patients undergoing LVRS alone . Lung volume reduction surgery has created an opportunity for the advanced imaging of emphysema. Patients with CT demonstrating an upper or lower lobe predominant pattern of emphysema have better patient outcomes after LVRS than patients with diffuse, homogeneously distributed emphysema throughout the lungs. While some patients with diffuse or homogeneous emphysema may have improved function or dyspnea after surgery, the magnitude of the improvement seen is less than in patients with heterogeneous emphysema. Given that emphysema patients are at risk for bronchogenic carcinoma, care should be taken to identify and anatomically describe the location of noncalcified pulmonary nodules in patients that are candidates for LVRS. 1. JD Cooper, EP Trulock, AN Triantafillou, et al. Bilateral pneumectomy (volume reduction) for chronic obstructive pulmonary disease. J Thorac Cardiovasc Surg 1995; 109:106-119. 2. JS Klein, G Gamsu, WR Webb, JA Golden, NL Muller. High-resolution CT diagnosis of emphysema in symptomatic patients with normal chest radiographs and isolated low diffusing capacity. Radiology 1992; 182:817-821. 3. NK Chin, TK Lim. A 39-year-old smoker with effort dyspnea, normal spirometry results, and low diffusing capacity. Chest 1998; 113:231-233. 4. PA Gevenois, V de Maertelaer, P De Vuyst, J Zanen, JC Yernault. 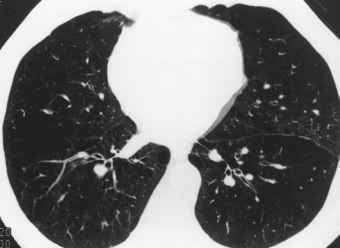 Comparison of computed density and macroscopic morphometry in pulmonary emphysema. Am J Respir Crit Care Med 1995; 152:653-657. 5. NL Muller, CA Staples, RR Miller, RT Abboud. 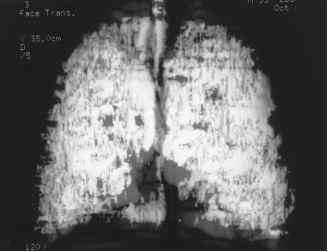 ''Density mask'': An objective method to quantitate emphysema using computed tomography. Chest 1988; 94: 782-787. 6. K Bae, R Slone, D Gierada, R Yusen, J Cooper. Patients with emphysema: quantitative CT analysis before and after lung volume reduction surgery-work in progress. Radiology 1997; 203:705-714. 7. RM Slone, DS Gierada. Radiology of pulmonary emphysema and lung volume reduction surgery. Semin Thorac Cardiovasc Surg 1996; 8:61-82. 8. RM Slone, TK Pilgram, DS Gierada, et al. Lung volume reduction surgery: comparison of preoperative radiologic features and clinical outcome [see comments]. Radiology 1997; 204:685-693. 9. DS Gierada, RM Slone, KT Bae, RD Yusen, SS Lefrak, JD Cooper. Pulmonary emphysema: comparison of preoperative quantitative CT and physiologic index values with clinical outcome after lung-volume reduction surgery. Radiology 1997; 205:235 -242. 10. K Suga, K Nishigauchi, N Matsunaga, et al. Three-dimensional surface displays of perfusion SPECT in the evaluation of patients with pulmonary emphysema for thoracoscopic lung volume reduction surgery. Nucl Med Commun 1997; 18: 719-727. 11. K Suga, K Nishigauchi, N Matsunaga, et al. Preliminary application of dynamic pulmonary xenon-133 single-photon emission tomography in the evaluation of patients with pulmonary emphysema for thoracoscopic lung volume reduction surgery. Eur J Nucl Med 1998; 25:410-416. 12. K Sugi, T Matsuoka, T Tanaka, et al. Lung volume reduction surgery for pulmonary emphysema using dynamic Xenon-133 and Tc-99m-MAA SPECT images. Ann Thorac Cardiovasc Surg 1998; 4:149-153. 13. KR Flaherty, EA Kazerooni, JL Curtis, et al. Emphysema gradient and the severity of hyperinflation predict outcome after bilateral lung volume reduction surgery for emphysema. Chest 2001; 119:1337-1346. 14. A Dirksen, JH Dijkman, F Madsen, et al. A randomized clinical trial of alpha(1)-antitrypsin augmentation therapy. Am J Respir Crit Care Med 1999; 160:14681472. 15. HO Coxson, RM Rogers, KP Whittall, et al. A quantification of the lung surface area in emphysema using computed tomography. Am J Respir Crit Care Med 1999; 159:851-856. 16. M Mishima, H Itoh, H Sakai, et al. Optimized scanning conditions of high resolu tion CT in the follow-up of pulmonary emphysema. J Comput Assist Tomogr 1999; 23:380-384. TL Petty, GG Weinmann. Building a national strategy for the prevention and managament of and research in chronic obstructive pulmonary disease. National Heart, Lung and Blood Institute Workshop Summary. Bethesda, Maryland, August 29-31, 1995. J Am Med Assoc 1997; 277:246-253. AT Society. Standards for the diagnosis and care of patients with chronic obstructive pulmonary disease. Am J Respir Crit Care Med 1995; 152:S77-S121. R Senior, N Anthonisen. Chronic obstructive pulmonary diseae (COPD). Am J Respir Crit Care Med 1998; 157:S139-S147. P Pratt. 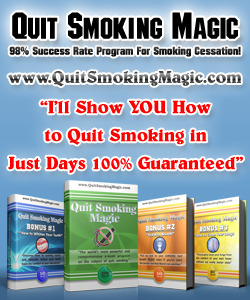 Emphysema and chronic airways disease. In: D Dail, S Hammar, eds. Pulmonary Pathology. New York: Springer-Verlag, 1988, pp 654-659. C Bergin, N Müller, DM Nichols, et al. The diagnosis of emphysema: A computed tomographic-pathologic correlation. Am Rev Respir Dis 1986; 133:541546. RR Miller, NL Muller, S Vedal, NJ Morrison, CA Staples. Limitations of computed tomography in the assessment of emphysema. Am Rev Respir Dis 1989; 139:980-983. M Tanino, M Nishimura, T Betsuyaku, et al. [A comparative study of computed tomographic techniques for the detection of emphysema in middle-aged and older patient populations]. Nihon Kokyuki Gakkai Zasshi 2000; 38:368-372. WR Webb. Radiology of obstructive pulmonary disease. Am J Roentgenol 1997; 169:637-647. Remy-Jardin M, J Remy, B Gosselin, MC Copin, A Wurtz, A Duhamel. Sliding thin slab, minimum intensity projection technique in the diagnosis of emphysema: histopathologic-CT correlation. Radiology 1996; 200:665-671. RH Hruban, MA Meziane, EA Zerhouni, et al. High resolution computed tomography of inflation-fixed lungs: pathologic-radiologic correlation of centrilobular emphysema. Am Rev Respir Dis 1987; 136:935-940. D Spouge, JR Mayo, W Cardoso, NL Müller. 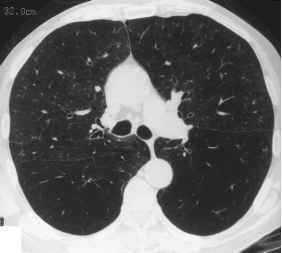 Panacinar emphysema: CT and pathologic findings. J Comput Assist Tomogr 1993; 17:710-713. PA Gevenois, JC Yernault. Can computed tomography quantify pulmonary emphysema? Eur Respir J 1995; 8:843-848. PA Gevenois, J Zanen, V de Maertelaer, P De Vuyst, P Dumortier, JC Yernault. Macroscopic assessment of pulmonary emphysema by image analysis. J Clin Pathol 1995; 48:318-322. PA Gevenois, P De Vuyst, M Sy, et al. 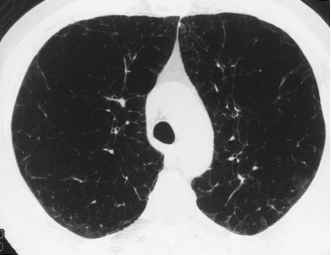 Pulmonary emphysema: quantitative CT during expiration. Radiology 1996; 199:825-829. F Sakai, G Gamsu, JG Im, CS Ray. Pulmonary function abnormalities in patients with CT-determined emphysema. J Comput Assist Tomogr 1987; 11:963968. N Sakai, M Mishima, K Nishimura, H Itoh, K Kuno. An automated method to assess the distribution of low attenuation areas on chest CT scans in chronic pulmonary emphysema patients. Chest 1994; 106:1319-1325. 33. C Sanders, PH Nath, WC Bailey. Detection of emphysema with computed tomography. Correlation with pulmonary function tests and chest radiography. Invest Radiol 1988; 23:262-266. 34. WL Foster, Jr, PC Pratt, VL Roggli, JD Godwin, RA Halvorsen, Jr, CE Putman. Centrilobular emphysema: CT-pathologic correlation. Radiology 1986; 159:2732. 35. K Nishimura, K Murata, M Yamagishi, et al. Comparison of different computed tomography scanning methods for quantifying emphysema. J Thoracic Imaging 1998; 13:193-198. 36. NL Müller, WM Thurlbeck. Thin-section CT, emphysema, air trapping, and airway obstruction [editorial; comment]. Radiology 1996; 199:621-622. 37. K Kuwano, K Matsuba, T Ikeda, et al. The diagnosis of mild emphysema: correlation of computed tomography and pathology scores. Am Rev Respir Dis 1990; 141:169-178. 38. WM Thurlbeck, MS Dunnill, W Hartung, BE Heard, AG Hepplestn, RC Ryder. A comparison of three methods of measuring emphysema. Human Pathol 1972; 1:215-226. 39. M Mishima, T Hirai, Z Jin, et al. Standardization of low attenuation area versus total lung area in chest X-ray CT as an indicator of chronic pulmonary emphysema. Front Med Biol Eng 1997; 8:79-86. 40. RJ Lamers, GJ Kemerink, M Drent, van JM Engelshoven. Reproducibility of spirometrically controlled CT lung densitometry in a clinical setting. Eur Respir J 1998; 11:942-945. 41. EA Kazerooni, RI Whyte, A Flint, FJ Martinez. Imaging of emphysema and lung volume reduction surgery. Radiographics 1997; 17:1023-1036. 42. KJ Park, CJ Bergin, JL Clausen. Quantitation of emphysema with three-dimensional CT densitometry: comparison with two-dimensional analysis, visual emphysema scores, and pulmonary function test results. Radiology 1999; 211:541547. 43. HU Kauczor, CP Heussel, B Fischer, R Klamm, P Mildenberger, M Thelen. Assessment of lung volumes using helical CT at inspiration and expiration: comparison with pulmonary function tests. Am J. Roentgenol 1998; 171:1091-1095. 44. R Uppaluri, T Mitsa, M Sonka, EA Hoffman, G McLennan. Quantification of pulmonary emphysema from lung computed tomography images. Am J Respir Crit Care Med 1997; 156:248-254. 45. EA Hoffman, G McLennan. Assessment of the pulmonary structure-function relationship and clinical outcomes measures: quantitative volumetric CT of the lung. Acad Radiol 1997; 4:758-776. 46. NJ Morrison, R Abboud, F Ramadan, et al. Comparison of single breath carbon monoxide diffusing capacity and pressure-volume curves in detecting emphysema. Am Rev Respir Dis 1989; 139:1179-1187. 47. NJ Morrison, RT Abboud, Müller NL, et al. Pulmonary capillary blood volume in emphysema. Am Rev Respir Dis 1990; 141:53-61. 48. AF Gelb, M Schein, J Kuei, et al. Limited contribution of emphysema in ad vanced chronic obstructive pulmonary disease. Am Rev Respir Dis 1993; 147: 1157-1161. 49. AF Gelb, JC Hogg, NL Muller, et al. Contribution of emphysema and small airways in COPD. Chest 1996; 109:353-359. 50. S Eda, K Kubo, K Fujimoto, Y Matsuzawa, M Sekiguchi, Sakai F. The relations between expiratory chest CT using helical CT and pulmonary function tests in emphysema. Am J Respir Crit Care Med 1997; 155:1290-1294. 51. M Haraguchi, S Shimura, W Hida, K Shirato. Pulmonary function and regional distribution of emphysema as determined by high-resolution computed tomography. Respiration 1998; 65:125-129. 52. Y Nakano, H Sakai, S Muro, et al. Comparison of low attenuation areas on computed tomographic scans between inner and outer segments of the lung in patients with chronic obstructive pulmonary disease: incidence and contribution to lung function. Thorax 1999; 54:384-389. 53. W Wisser, W Klepetko, M Kontrus, et al. Morphologic grading of the emphyse-matous lung and its relation to improvement after lung volume reduction surgery. Ann Thorac Surg 1998; 65:793-799. 54. W Weder, R Thurnheer, U Stammberger, M Burge, EW Russi, KE Bloch. Radio-logic emphysema morphology is associated with outcome after surgical lung volume reduction. Ann Thorac Surg 1997; 64:313-319; discussion 319-320. 55. R Thurnheer, E Hermann, W Weder, et al. Role of lung perfusion scintigraphy in relation to chest computed tomography and pulmonary function in the evaluation of candidates for lung volume reduction surgery. Am J Respir Crit Care Med 1999; 159:301-310. 56. MD Becker, YM Berkmen, JH Austin, et al. Lung volumes before and after lung volume reduction surgery: quantitative CT analysis. Am J Respir Crit Care Med 1998; 157:1593-1599. 57. E Kazerooni, F Martinez, L Quint, R Whyte. Quantitative helical CT indices of emphysema as predictors of outcome after lung volume reduction surgery. Radiology 1996; 201(P):298. 58. E Pompeo, G Sergiacomi, I Nofroni, W Roscetti, G Simonetti, TC Mineo. Morphologic grading of emphysema is useful in the selection of candidates for unilateral or bilateral reduction pneumoplasty. European Journal of Cardio-Thorac Surg 2000; 17:680-686. 59. WM Thurlbeck, NL Müller. Emphysema: definition, imaging, and quantification. Am J Roentgenol 1994; 163:1017-1025. 60. EA Kazerooni, JL Curtis, R Paine, MD Iannettoni, P Lewis, FJ Martinez. Long-term outcome after bilateral apical lung volume reduction surgery (LVRS) via median sternotomy: predictive value of quantitative helical CT analysis (QCT) and physiologic severity of hyperinflation. Radiology 1998; 209(P):257. 61. A Rozenshtein, CS White, JH Austin, BM Romney, Z Protopapas, MJ Krasna. Incidental lung carcinoma detected at CT in patients selected for lung volume reduction surgery to treat severe pulmonary emphysema. Radiology 1998; 207: 487-490. 62. EA Kazerooni, LC Chow, RI Whyte, FJ Martinez, JP Lynch. Preoperative examination of lung transplant candidates: value of chest CT compared with chest radiography. AJR Am J Roentgenol 1995; 165:1343-1348. 63. R Slone, D Gierada, T Lopes. Unsuspected bronchogenic carcinoma in patients with severe pulmonary emphysema being evaluated for lung volume reduction surgery. AJR 1997; 168(A):112. 64. S Adusumilli, E Kazerooni, T Ojo. Screening CT for lung cancer: a study of emphysema patients being evaluated for lung volume reduction surgery. Radiology 1998; 209(P):222-223. 65. RJ McKenna, Jr., RJ Fischel, M Brenner, AF Gelb. Combined operations for lung volume reduction surgery and lung cancer. Chest 1996; 110:885-888. 66. TC Ojo, F Martinez, R Paine, 3rd et al. Lung volume reduction surgery alters management of pulmonary nodules in patients with severe COPD. Chest 1997; 112:1494-1500. Among the evils which a vitiated appetite has fastened upon mankind, those that arise from the use of Tobacco hold a prominent place, and call loudly for reform. We pity the poor Chinese, who stupifies body and mind with opium, and the wretched Hindoo, who is under a similar slavery to his favorite plant, the Betel but we present the humiliating spectacle of an enlightened and christian nation, wasting annually more than twenty-five millions of dollars, and destroying the health and the lives of thousands, by a practice not at all less degrading than that of the Chinese or Hindoo. 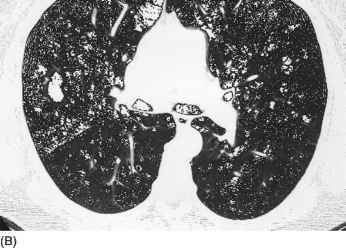 Can CT scan grade emphysema? ARE THE RESUTS WITH CT&PET SCANS SIMILAR WITH ASBESTES DISEASE AND EMPHYSEMEA 7EMPHSEMIA? What does moderate centrilobular emphysema with an upper lobe predominace mean on a cat scan?